Last week, in my second post dedicated to Tarot and Relationships, I presented a technique for healing troublesome relationships using the Tarot and affirmations. This week, I’m going to present a couple of spreads you can use to do readings that will show you how to solve your relationship issues. First up is a powerful Five-card Relationship Spread. 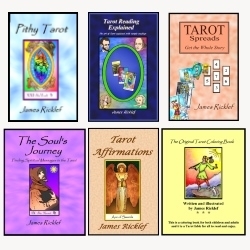 In my book, Tarot Spreads: Get the Whole Story, I explain this Spread, and I present a couple of sample readings with it. Here is a brief overview. This basic spread layout can be used for both finding and healing a relationship, but the positional interpretations differ depending on which goal you are shooting for. What patterns of resistance keep coming up in your relationships? For example, how do you try to control other people? What games do you play in your relationships? Etc. What do you fear about having a relationship? How do you block love in your life? What do you need to let go of to find love and romance? How can you heal your relationship with yourself? What patterns are causing problems in this relationship? For example, do you keep trying to control the other person? What games do you play over and over in this relationship? Etc. What are your fears in this relationship? How do you block love in this relationship? What do you need to let go of to make this relationship work? How can you heal this relationship? Regardless of which way you want to use this spread (finding or healing a relationship), whenever you do a reading for relationship issues, try to use an open ended question. * What do I need to know about my relationship with ________________? * What do I need to know about my patterns of resistance to finding a positive relationship? * What do I need to know to help me find and nurture a positive and supportive relationship in my life? Here is a six card relationship spread that two people in a relationship can do together — in tandem, so to speak. The cards in the first row are for person A and the second row is for person B. Person A deals three cards into the first row, then B deals three cards into the second row. Then each person takes turns discussing what they think their cards mean. The positional definitions for reading these cards are below. 1. How do I see myself in this relationship? 2. How do I view the relationship? 3. How do I see the other person in this relationship? Using this “tandem” spread is a great way to open up a dialog about a relationship. Of course, both parties have to be open to doing this, and this really only works well when the problems in the relationship have not become so sour that an honest, respectful dialog is no longer possible. In fact, the best time to use this spread is before serious problems crop up — sort of like using it as preventative medicine. Finally, I have posted a Seven-card relationship spread for readings that can show you how to improve your relationship, whether that means solving the problems in one or just making a good one better. This, and many other valuable spreads, are explained and illustrated using sample readings in my book, Tarot Spreads: Get the Whole Story. Thanks for showing these James. I have just done another 2 day festival here in NZ, where I offered readings from my particular stall. I would say approximately 40% of requesters have no issue they want to look at, so it is a general reading. However at least 40% want relationships to be looked at. And you are right – they fall into the two distinct camps of “I haven’t got a relationship but want one, what is coming up?” or “I am not happy in my relationship”. I swear with the former they think I can wave the magic wand, and in a week’s time their own vision of George Clooney will walk in and sweep them off their feet. Like you, I see how important it is to look at their own dynamics and how that may or may not be influencing the fact they are single at the time of the reading. I still get disappointments shown when I cannot give them an exact day when they will find Mr / Miss Right, or give other indications of outcomes, but I just can’t do that. Most just want to know “when” – they are not interested in looking at the “how” and what they need to perhaps address or change within themselves. “When” to them comes with a date attached to it. 🙂 Whereas I tend to see “when” as being when they have perhaps understood what they want and what they need to do to bring about change in their circumstances. What I like about this 5 card spread is that it is empowering and can be used for both sides of the coin so to speak. I usually use cards to look at previous experiences to see what has been learned from them. Quite often it shows patterns being repeated, so a cycle needs to be broken. This can definitely be shown in the first card position and is quite key really. I would recommend this spread for sure. Maybe from that point it can lead to further investigation but in its own right it can help the receiver self-reflect in a way they may not have done prior to the reading. I think that asking “when” (instead of “how”) indicates a vain hope that they don’t have to do anything to make a change in their life. And that’s unfortunate because it’s pretty darn rare that all someone needs to do is sit back and wait for a positive change. As for actually addressing the “when” question (because people really do want to know that! ), I tell them that the Tarot isn’t like a clock or a calendar; it’s like a map. And so one thing I sometimes do is pull cards until I get to one that indicates their outcome and then I explain the preceding cards as being signposts that have to be passed before they can get to that outcome. I really like your description of the Tarot as a map rather than a clock! I shall definitely be using that tip. I always tend to rephrase “when” questions in any case to try to make them more empowering, so these spreads look great as options to offer.